This is the first time I have used this company and am very pleased with the service. I used their service to exchange odds and ends of multiple currencies. It was quite straightforward, although I was nervous of posting cash (special delivery secure) and I was nicely surprised to so the expected amount (decent rates) in my account within an impressive 48hrs. Would now happily use them again. I was able to sell Hong Kong Dollar banknotes at a good rate, but also Hong Kong coins that no one else seemed to take. Excellent service. Ordering on website was straightforward, I was a little concerned paying directly from my bank account. No worries. The money arrived via Royal Mail as promised within 48 hours. Best exchange rate. I send off a selection of banknotes and some coins, paid by bank transfer and seemed to be a good rate. Excellent service. I dropped off a bag full of unsorted coins and some old bank notes and a day later money was wired to my paypal account. They did all the sorting and provided a report detailing each and every currency along with the exchange rate. I'd highly recommend UTM to anybody who has a load of old currency and wants to release some value. As well as exchanging some Bulgarian money I was also able to get rid of some Kazakhstan Tenge which I thought no one would take in the UK. Paymant was quick and direct to my bank account. 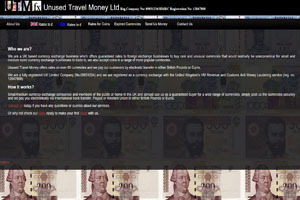 I have changed some HK dollars to pounds with UTM fx and they have been ever so helpful and got back to me very quickly! I am very pleased with the quality of service and will recommend you to others because of my satisfaction! I am looking forward to doing the business with you for years to come! I sent in a bundle of bank notes from previous travels some of which appeared to be countries not accepted at other exchanges (and I had tried a few). Payment was prompt and efficient. Very good. I Came home with Nepali rupees which would have gone to waste without this company. After 3 days the money was in my paypal account with an email saying they apologised for the delay. Happy with the service overall. On the strength of other reviews I overcame a natural nervousness about putting cash in the post to an organisation I had not used before - but the service provided was extremely efficient and prompt, and gave me the best available value for my money. Thank you. I emailed to secure a rate which they confirmed and responded to quickly. I sent my unused Kuna on Friday and received the exchange on Tuesday. Nothing bad to report, great service. Buy back Hungarian Forints. The Post Office and HSBC were unable to take back all my Hungarian notes when I got back from holiday, but this company did with no fuss or bother. The rate of sterling I received was good and processing time speedy. So quick and easy to use. Got an estimate, down loaded and completed simple form and posted Kuna to UTM. Money in my account the next day. Would definitely recommend and use again. I sold some left over Croatian Kuna that I had sitting in a draw from my travels earlier this year. I was a bit apprehensive about posting £600 worth of currency, but I had emailed ahead to secure a rate and the customer service department were very reassuring when I called. I received an email confirmation of my order. The whole process was swift and professional, not to mention that I got a great exchange rate! I will definitely be using the company again and will recommend UTM fx to all my friends and family! Definitely Five Star company! I got the best rate I could find on South African Rand, and I was also able to get rid of some Botswanan Pula I had, no one else I could find would take them. I cannot lie despite the excellent reviews you still have that little doubt in your mind as you put all that money in an envelope and post it off, But it was fantastic, excellent communication via e-mail and the exchange rate given was brilliant, the money was in my bank account the next working day and they even e-mailed me to confirm this, I could not recommend this company enough and I will certainly be using them again. Excellent service.Sold Ukrainian Hryvnia and had money paid into my account within 48 hours.Would recommend UTM to anyone wishing to sell their unused currency. Emailed for a rate and posted £200 pounds worth of Ukrainian money in to them, received payment via paypal within 3 days. Send my Romanian and Ugandan currency in last Friday and the money was in my account by Monday evening. Would recommend.